The Family International originated in Huntington Beach, California in 1968, when the founder, David Brandt Berg (1919-1994) along with his family started a ministry aimed toward counterculture youth. Late In 1969, after the group had become about one hundred members, it was called The Children of God in the news. In 1972 there were 130 groups of full-time participants scattered across the world. Early in 1978, the Children of God went through a reorganization and was then called The Family of Love. All through it's history covering over 40 years, the movement went through a lot of changes in the methods and structure. 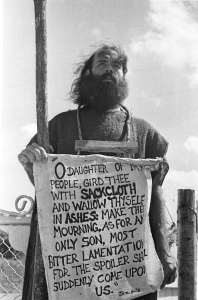 The Children of God have a colorful and unconventional history from the very beginning, its zealous hippie participants sent out a call for a return to the lifestyle and faith of the early Christians and spiritual revolution, picketed and also conducted sackcloth vigils, and cried out against the evils of injustice and war. The uncompromising stance of their information written by the founder, David Brandt Berg (1919–1994), and the very unconventional methods of demonstrating the Gospel and preaching employed by it's members drew a lot of attention from the news media and became well known around the globe. In South America and Europe The Children of God achieved fame as the original music of theirs gained some popularity as their bands signed big-stage performances and recording contracts, particularly in Brazil and France. From radical rock & roll songs denouncing hypocrisy of the establishment as it existed then, to heart-rending folk ballads about the love of God, the original music was a prominent part of the movement's culture and outreach. Children of God was foremost and first an active missionary endeavor, during its first 10 years a lot of members left the United States to set up mission posts in other countries across the planet. In 1977 there were over 740 Children of God groups in a total of 73 countries. At the close of 1977, their members had handed out over 306 million pieces of Gospel information and had prayed with one and a half million people to accept Christ. The organization was brought to a sudden stop in February 1978. Stories of very serious abuse of authority and misconduct by a number of it's leaders prompted the founder to get rid of all the leaders and declare general dissolution of the Children of God.